USBAPP8HD : 3-foot Heavy-duty USB to Apple 8-Pin lightning Charge & Data Cable. Superior quality flat noodle wire, with reinforced plugs. For iPhone, 5, 5s, 5c, 6, 6s, 6s plus, 7; iPad, iPad Mini, iPad Air. 36" length. 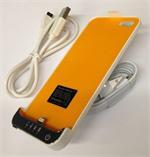 SALE - PowerBank 2600: 5VDC 2600mAh Li-ION Backup Battery Charger - READY TO USE! For all your portable digital devices that charge up with 5VDC. Provides immediate power from USB 2.0 port on top. 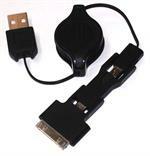 Re-charges with supplied micro USB cable-to-USB 2.0. ACUSB1A : AC-to-USB2.0 converter. Worldwide intput 100-240VAC. Output: 5VDC @ 1A via USB2.0 port. Ideal for charging smartphones, phones, cameras, GPS, etc - anything that can charge with from 1A USB port. USBAPP8 : Charging & Data cable for iPhone 5, 5s, 5c, 6, 6s, 6s Plus, 7, iPad mini. Has 8-Pin connector at one end, USB 2.0 connector at other end. 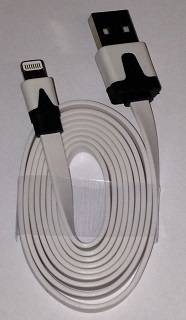 Length = 3 ft.
APP30-8 : Adapter for Apple chargers. Converts Apple 30-Pin charger to new Apple 8-Pin "lightning" connector. Enables your older Apple charging devices to be used with iPhone 5, 5c, 5s, 6, 6s. APP30-8 : Adapter for Apple 30-Pin to APple 8-Pin lightning connector. Converts 30-Pin charging devices to 8-Pin for iPhone 5, 5s, 5c, 6, 6s, 7, iPad mini. Fully compatible. USB2.0-to-Apple 30-Pin adapter. 3-foot length. For Charging & Data transfer. Suitable for iPhones, iPods, and iPads with 30-Pin connector. Plug into our ACUSB1A for perfect travel charger combo ! USBAPP6 : 6-foot cord, standard thickness, USB2.0 to 8-Pin Lightning connector. 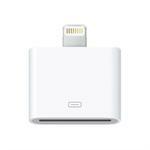 Provides charging & data transfer for iPhones & iPads. EC2AA : Emergency USB charger with flashlight, runs on 2 x AA alkaline or lithium batteries. Provides 5VDC output froma USB2.0 port @ up to 800mA, for charging phones, digital cameras, MP3, GPS - any small portable device that charges from 5VDC. 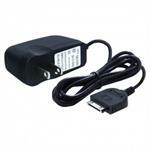 IPHONE-DCP : Mobile DC Power & Charge Cord for Apple iPhone, iPhone 3G, iPhone 4, iPhone 4s, and iPod models. Powers device AND charges battery. The IPHONE-DCP is a DC Power & Charging cord for your iPhone, iPhone3G, iPhone 4, iPhone 4s, IPOD models. Plugs into 12-13.8VDC Socket; other end plugs up into iPhone / iPod. Provides instant power for the device, AND simultaneously charges battery. IPHONE-WTC : Worldwide Wall Charger / Power supply for your iPhone, iPhone 3G, iPhone 4, iPhone 4s, and iPod models. Plugs into 100-240VAC wall outlets; other end plugs up into your Apple device. USBAPP8-10 : USB2.0 to Apple Lightning adapter cable - 10 ft.
USBAPP8-10 : USB2.0 to Apple 8-Pin Lightning charging & data transfer cable. 10 foot length, standard gauge wire. Fits iPhone 5, 5s, 5c, 6, 6s, 6s plus, 7; iPad, iPad mini, iPad Air. 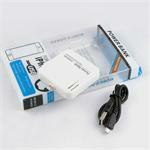 ACUSB2.1+1 : AC Wall Charger with Dual USB outputs: 5VDC 2.1A, and 5VDC 1.0A. For SmartPhones, phones, Cameras, iPods, Tablets, etc. WEB SALE PRICE ! DC2USB3.1 : DC Power Plug to 2 USB outputs. Input: 12-24VDC (vehiclesocket). Output = 5VDC to each USB2.0 outlet @ 3.1A max. Can charge 2 phones at the same time (1A each), or 1 Tablet (3.1A total), or 1 phone and and 1 Tablet (3.1A combined). ACUSB10W : 10W USB Power Adapter. Plugs into worldwide AC wall outlets; output is 5VDC @ 2.1A. USB-R3CONN : USB Retractable cable with mini USB, micro usb, and Apple 30-pin connectors. USBAPP8HD6 : 6-foot USB to 8-Pin lightning heavy duty flat noodle adapter cable, for Apple devices. Use for data transfer & charging. For iPhone 5, 5s, 5c, 6, 6s, 6s plus, 7; iPad, iPad mini, iPad Air. 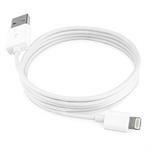 USBAPP8HD10 : 10-foot USB-to-8 Pin Charging & Data transfer Cable - for Apple. Heavy duty flat noodle wire, with reinforced plugs. For iPhone 5, 5s, 5c, 6, 6s, 6s plus, 7; iPad, iPad mini, iPad Air. 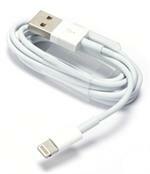 DC-IP12 : DC Power & Charge Cord for iPad 1 thru 4, iPhone 4. Delivers 5VDC @ 2A output. 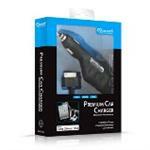 The DC-IP12 is a 12VDC vehicle charger for iPad & iPhones. Plugs into 12-13.8v DC socket. Output is 5VDC @ 2A. 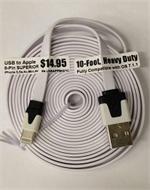 Has heavy-duty coiled cord & apple 30-Pin plug for inserting into iPad 1 thru 3, and iPhone 4, 4s. DC4USB-10A: DC to USB adapter,4 ports, 10-Amp 50-Watt combined output. Plugs into 12-24VDC (DC socket); has 4 USB output ports. 10A combined output; can charge 4 devices at once ! 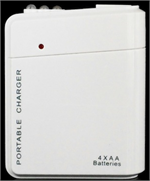 PortaCharger AA : Portable Charger - holds 4 x AA Alkaline batteries, has USB2.0 output & LED light. PortaCharger AA : Handy portable battery charger. Runs on 4 x AA Alkaline batteries (sold separately). has 5VDC USB2.0 output, and also can be used as a bright LED flashlight! 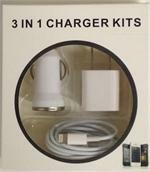 USB-CKA5 : 3-in-1 Charger kit for iPhone 6, 5, 5c, 5s, Mini, Air, iPad4. Fully compatible with the latest Apple operating systems. 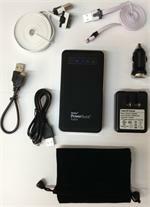 Includes (1) USB data & charge cable, (2) Wall Power Supply, & (3) DC Power Supply. PowerBank2200 : Battery Charger for iPhone 5, 5c, 5s, 6, 6s, iPad mini. Arrives Pre-charged & READY TO USE. Plugs right into iPhone and begins charging immediately. Typically provides 1 full charge into Phone. Includes micro USB re-charging cable. BP-1275-1.4 : 3.7v 1400mAh rechargeable Li-Po Battery rebuild kit for iPhone 4, 4G. Includes new battery and tools. BP-1276-1.4 : 3.7v 1430mAh Li-PO battery rebuild kit for iPhone 4S (16Gb, 32Gb, 64Gb). Includes new battery and tools. BP-1277-1.4: 3.7v 1440mAh Li-PO battery rebuild kit for iPhone 5. Includes new battery & tools. For iPhone 5 16Gb, 5 32Gb, 5 64Gb, 5 CDMA, 5GSM, MD293C/A, MD293LL/A.